I’m pretty sure I would eat chili all winter long if my family would let me. To me, it’s like coffee. It’s an experience. I not only LOVE the taste of coffee….but I like the comfort. I love the mug I drink it out of. I love the warmth, the sitting with a cup and wrapping myself in a blanket. I love the smell of coffee brewing, because I know what’s to come! I love the whole experience of drinking coffee. That’s how I feel about chili. I love the smell of chili cooking. The warmth of a bowl and the flavors. It’s true comfort food in my book. Am I totally out of my mind? Can anyone relate? Today’s version is a white chicken chili. It’s low fat and delicious! Perfect if you want a cup of comfort food, but don’t want to sacrifice your healthy eating habits! .Cut your chicken into small, bite sized pieces and you’ll want to cook it in the dutch oven with a little olive oil until it browns. Once browned, add the remaining ingredients for your soup, cover it all up and simmer for about an hour. Before serving, add the milk and lime juice and heat on medium until hot! Oh my heavens, the aroma that fills your house will be amazing! When you’re ready to serve, sprinkle with a just a touch of monterey jack cheese, a dollop of plain greek yogurt (to keep it healthy) and a sprig of parsley for color (we eat with our eyes first)! ENJOY your chili experience! One more tip. This dinner can totally be made in the crock pot too! Add everything into your slow cooker, except the milk and lime juice. Heat on low for 6 hours. Before serving, add milk and lime juice and allow to heat (about 20 minutes). Serve and enjoy!! 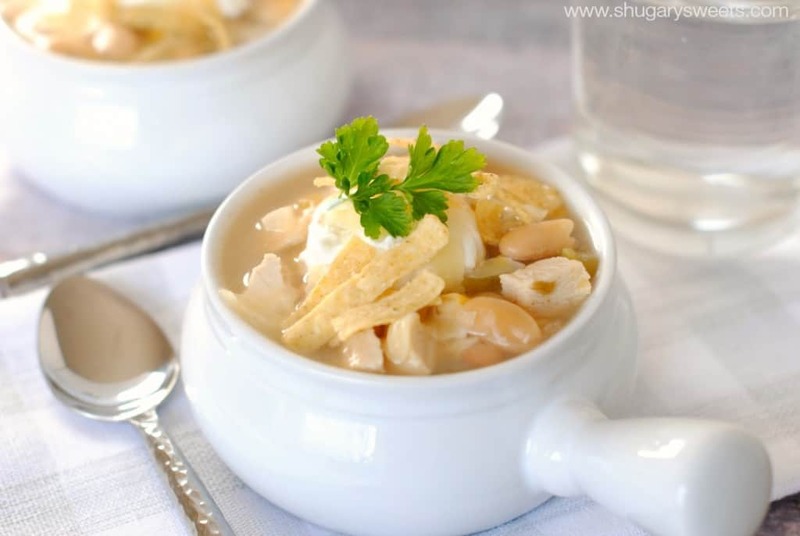 Easy white chicken chili recipe made on the stove top! In a large dutch oven (soup pot), heat olive oil over medium high heat. Add diced chicken breast and cook until browned on all sides (about 5 minutes). Add onion, green chilies, chicken broth, cumin, chili powder, paprika, beans, corn, and garlic powder. Reduce heat to a simmer. Cover and cook for about an hour, stirring occasionally. Add milk and lime juice. Turn heat to medium and cook until milk is incorporated and chili is hot (about 10 minutes). Serve immediately. Add shredded cheese, greek yogurt and parsley for a garnish if desired. Recipe can also be made in the slow cooker! Add all ingredients except the milk and lime juice to your crockpot. Heat on low for 6 hours. Before serving add milk and lime juice and heat for an additional 20 minutes. Serve and enjoy! Love Chili and other comfort foods? Here’s a few of my favorites! 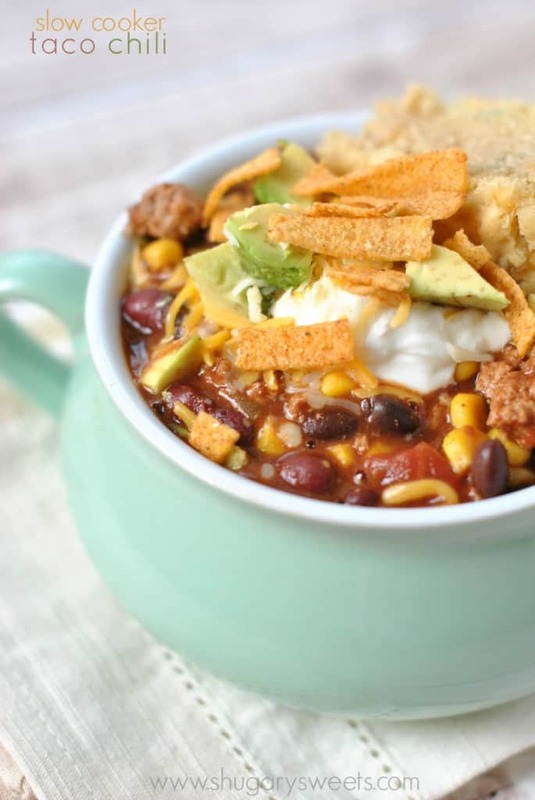 Slow Cooker Taco Chili: another great bowl of comfort food! Use ground turkey to keep it lean! 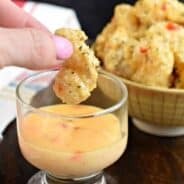 BBQ Chicken Pizza Soup: don’t forget the pizza crust dippers in the delicious recipe! Zuppa Toscana Soup: this Olive Garden copycat recipe is just as delicious as the original! Better cause it’s made at home! Thanks for the dinner inspiration! I love chili too and this is going to be on our table tonight! YUM! 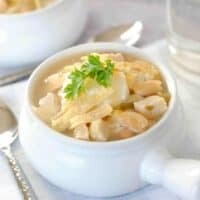 Chili is a must in the winter, and I love switching up the traditional with a white chicken version like you have here. Love the crunchies on top too! I always have to have something crunchy on my soups, stews and chili. Odd right? You gotta have chili when it’s this cold out. I like the idea of using the slow cooker best. I’m LAZY! 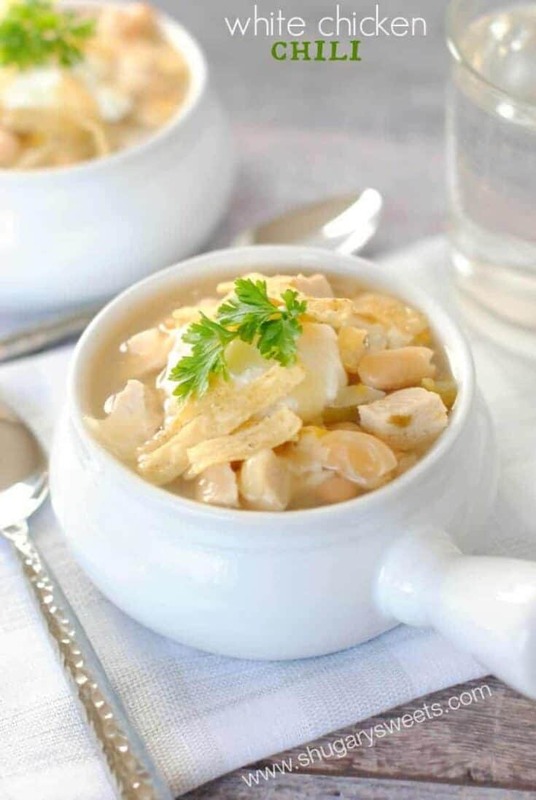 White chicken chili is my favorite kind of chili. Actually I don’t even really like ordinary chili. Ssh…don’t tell! But this was on my blog plan to make soon. Love the pretty pictures. Looks comforting and delish! Yum!!! This look sooooo good 🙂 Love the bowl too!! One of my favorite chilis! 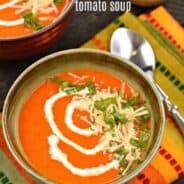 So flavorful and healthier! Love it, sharing now! A bowl of this would do quite nicely in my tummy right now! Yum! This gets me in the mood for chile! Love these images! They’re so crisp and white and just so pretty! Makes me want chili 🙂 Pinned! 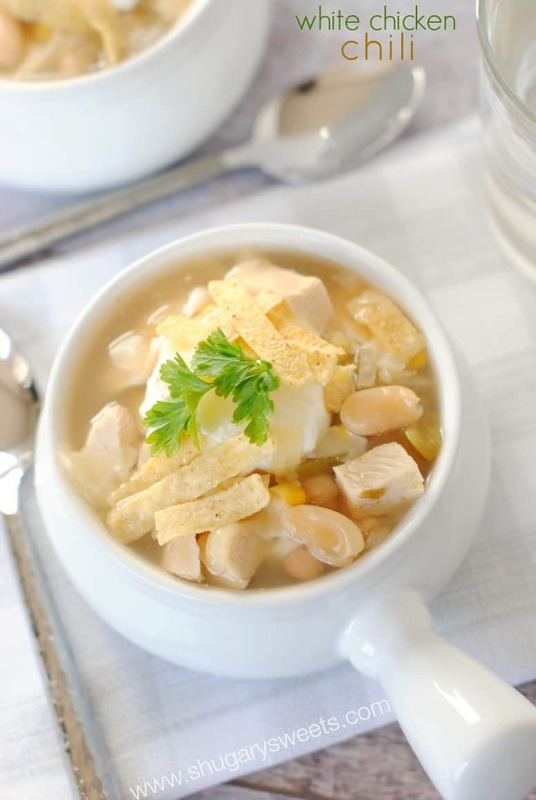 I could eat this white chicken chili every day! A bowl of this would be perfect right now! OK, your chili belongs on anyones Super Bowl menu. 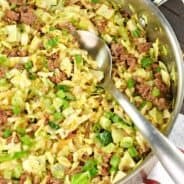 This recipe came over on my Bloglovin feed and I’d love it if you would share it at my Tuesday link party, Tickle My Tastebuds. Chili is so comforting. I love it. 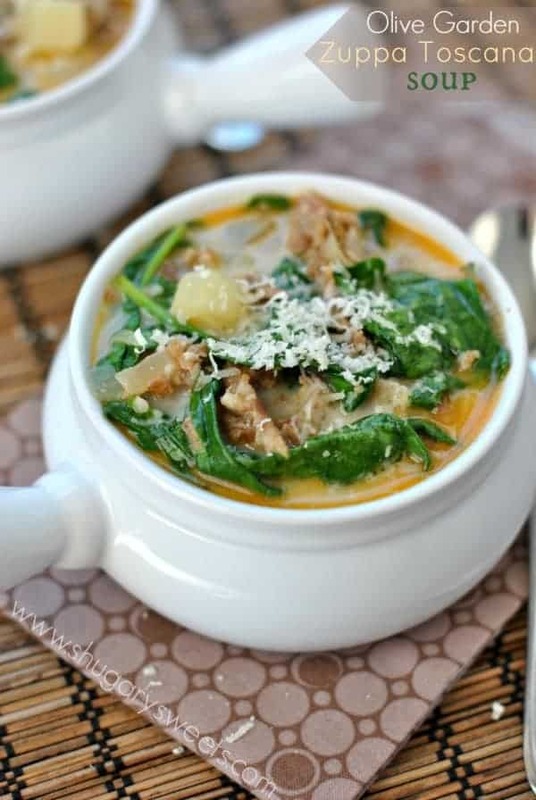 I could definitely eat soups all winter long and be happy as a clam! I actually prefer this chili over regular chili most days. 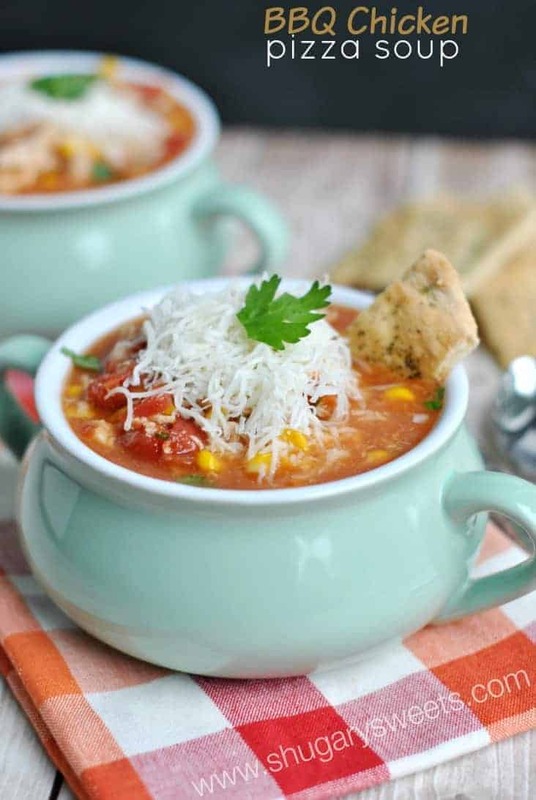 Although on cold winter days, I will take just about any kind of hot comfort food soup! Love these pics, girl!!! This chilli looks so delicious! Love the flavours, super comforting! My husband keeps telling me that we need to make chili soon. Since today is a snow day, it sounds like a perfect dinner! I am with you Aimee, I can have chili every day. I hate when the summers come because its to hot to have chili. This looks delicious! I think I need to make this tonight!! Thank you! 🙂 Have a great week!! You totally described me when drinking coffe, too! I love the smell, taste, and just relaxing on the couch with it. This chili gives me the same joy! Look so delicious, Aimee. Pinned! My boyfriend is buying me a slow cooker for my birthday *does happy dance*. This looks so good!